The essays within display a fantastic array of quality. Author: Matthew Wilhelm Kapell, Ace G. Pilkington, eds. 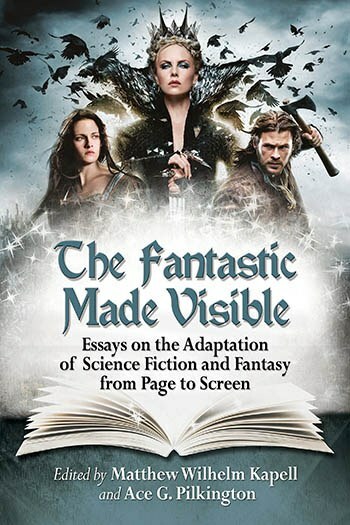 This collection of 14 essays “on the adaptation of science fiction and fantasy from page to screen” presents some interesting issues for both students of the fantastic genres as well as students of adaptation theory. The essays themselves cover a wide range of topics and seminal authors, from Jules Verne’s Journey to the Center of the Earth to Robert Heinlein’s Rocket Ship Galileo (adapted as Destination Moon) to the Harry Potter books, as well as up-to-the-moment adaptations such as Oz the Great and Powerful (2014). Several of the essays, in particular Kate Wolford’s “A Daughter, A Mother and a Mirror: Snow White and Hollywood” and “From (Psuedo)encyclopedic Fiction to America’s First Superhero: Abraham Lincoln: Vampire Hunter” by Nils Bothman, posit well-researched and interesting theories, both of which readily fulfill the promise and premise of this collection – namely to offer an analysis of the adaptation process and to look at the transitions between written and visual text. “’Look, you fools, you’re in danger!’ Cultural Snapshots in Four Iterations of Invasion of the Body Snatchers” by Kelley Crowley is probably the best of the bunch. He acknowledges the easy analysis offered by the first filmic version of Jack Finney’s work, but then looks at the other versions with a hypercritical eye. He notes “Teenaged angst is the perfect foil to the emotionless and unaffected solders [sic]. The setting of a military base is a sound choice; solders [sic] need to lack some individuality in order to do their jobs.” This reading takes into account the original text as well as the adaptation, which is precisely what it should do. Unfortunately, where the book falls short is with the number of essays that either fail to address the topic adequately or to push other areas of research within their chapters. Annah E, MacKenzie’s contribution, “From Screen to Shining Screen: The Wizard of Oz in the age of Mechanical Reproduction”, is a perfect example. The 14-page essay has some incredibly insightful looks at the move from the 1900 Baum text to the 1939 film (that she never mentions the two previous adaptations is forgivable as the 1939 film is the iconic film iteration), but she spends almost a third of the essay discussing the evolution and history of early television set sales. While this advances her analysis of the continuing popularity of the film (and is interesting in its own right) it doesn’t actually belong in an essay about adaptation. Readers would have been better served with a deeper analysis of Oz the Great and Powerful (which was insightful and accessible, something many other essays here lacked), even if meant her essay would be a little shorter. This points to the bigger problem with the collection: the editing itself. While the distinct lack of commas and other grammatical errors might be forgivable as mere typos, the poor quality of the writing and severe disparity in tone is not. There are points where it seems as if the essays were not read at all before inclusion in the book. In Brian Taves’ essay on Verne’s Journey to the Center of the Earth (which offers almost no analysis, favoring instead synopses of the various productions) there is a point where actor and character names are confused. A simple mistake, sure, but indicative of a larger problem. He could even go further with the technological advancements inherent in DVDs or digital downloads, but his point is valid and worthy. This, of course, begs the question as to why, two pages earlier, he refers to “[t]he six books of the Harry Potter series” as “inescapable.” If they were so inescapable, he might have noticed there were actually seven books in the series. This lack of attention to detail is frustrating at the least and counter-informative at the worst. Annah E. MacKenzie references author L. Frank Baum and “each of his seventeen Oz books” (there were 14 written by Baum) while William Hart’s essay about “Racebending” talks about Samuel L. Jackson playing the role of Nick Fury, originally created in the comic books as a white man, without ever mentioning that the comic character was redesigned as black mane (and in the likeness of Jackson) well before Jackson’s on-screen portrayal. Additionally, while some of the essays read easily, some are so personally biased (Roger Kaufman) or trying too hard to be “academic” and include numerous references, related or not (Cathy Leogrande), as to be virtually unreadable. In the end, unfortunately, Pilkington and Kapell spend too much time patting themselves on the back for the work they did while leaving the readers to wade through the mess they left with the work they didn’t do.